TOBY Edser celebrated his loan spell extension with a goal as Woking booked their place in the First Round of the FA Trophy with a 2-0 victory at home to Folkestone Invicta last Saturday. The Nottingham Forest under-23s midfielder Edser put Alan Dowson’s side ahead after 21 minutes, before Paul Hodges doubled The Cards’ lead in the 35th minute, as Woking made light work of their Bostik League Premier Division opponents. 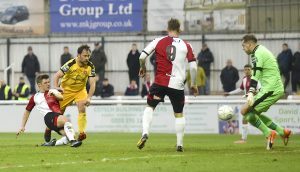 Folkestone had their best chance to score in the closing stages, when substitute Ian Draycott spurned a great opportunity from inside the six-yard box, as Woking held out to book their place in the First Round Proper of the FA Trophy. Reflecting on his side’s performance 24 hours after the match, Cards’ boss Alan Dowson said: “There was the potential for Folkestone to be a banana skin fixture, so I was pleased that we managed to get on top early.